This clean, contemporary, non-smoking chalet has a stained weatherboard exterior with a large wooden deck for alfresco dining. The combination dining and lounge room faces the water view. The cabin sleeps 5+ with one bedroom having a queen bed and the second having a combination double-single "trio" bunk. The couch in the lounge room can comfortably sleep a small child if desired. All rooms have ceramic tile floors except the bedrooms that are carpeted. The chalet has a fully equipped modern kitchen including electric stove with oven and grill, microwave, coffee plunger, teapot, toaster, water jug, quality kitchenware and fittings, iron and ironing board. The bathroom has a ceramic tile shower and basin with a separate toilet. In addition, there is the convenience of free shared laundry facilities (washers and dryer), and if you wish for that unbeatable freshness, there is a Hills Hoist. Kangaroo Cabin is equipped with a silent ceiling fan to supplement the natural summer ocean breezes and a shade sail over the deck for warm sunny days. A slow-combustion wood stove provides warmth for cosy winter nights. All windows and doors have screens. The gardens surrounding the cabin are all natives and provide stunning bursts of intense gold, orange, blue (yes, really), pink and magenta throughout the year. The many birds, particularly the rainbow lorikeets and rosellas that feed on the nectar and seeds, provide added colour and entertainment. If you wish entertainment beyond what the natural surrounds offer, there is a digital TV, DVD and stereo CD player. There is also a modest reading library, games for all ages and a family DVD collection. We recommend, however, your evening entertainment include finding constellations in the incredibly starry night sky to perhaps the serenade of the boobook owls. 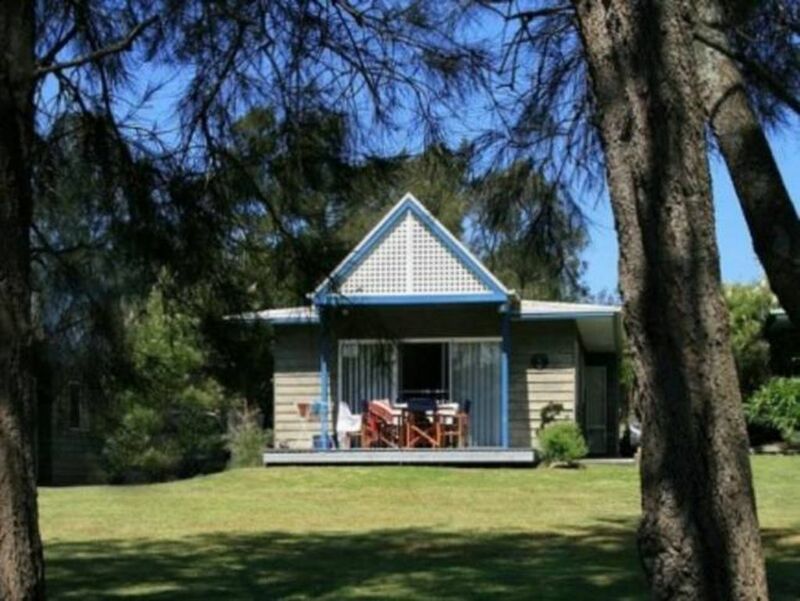 In any season, Kangaroo Cabin at Berrara Beach offers a variety of opportunities for relaxation in a beautiful, tranquil, natural environment. We invite you to come to experience for yourself the natural wonders at Kangaroo Cabin and take home idyllic memories of a lovely Aussie seaside vacation. Come and enjoy Kangaroo Cabin at Berrara Beach! The chalet looks out over Berrara Lagoon which is like a lake where you can swim, float or walk just 200 meters to Berrara Beach. You will hear the sound of the surf from inside Kangaroo Cabin and feel the ocean breezes scented with salt air from the deck. There is a reason for the name Kangaroo Cabin: In the mornings and at dusk you will be joined in the front paddock by any number of very friendly and curious kangaroos, some large, some juveniles, and occasionally, you'll see one still in the pouch! The property is bordered by Conjola National Park and Nature Reserve and is surrounded by bush and heaps of safe, open community play space for kids. The land in front and behind the chalet is all community property. You may use it and the paddock out back as much as you wish - a great spot for a friendly cricket match or football game. The front deck of the cabin is a perfect place to relax watching the kids play or swim in the lagoon, or just gaze lazily at the brilliant sunsets over the water in the twilight. No doubt you will see white bellied sea eagles gliding to or from their nests up the creek or be serenaded by the kookaburras, long time Berrara Beach residents. You can fish in the beach surf or prawn in the lagoon by moonlight. Bring a tinnie or kayak as the lagoon bends into Berrara Creek and meanders lazily through the National Park for four to five kilometres. The still, clear water magically mirrors the tall eucalypts along the shores. You'll find peaceful, secluded spots for a romantic lunch or swim as well as fantastic photo opportunities. Berrara Beach, just 200 metres at foot of the lagoon, is protected closest to the cabin for the little ones, and becomes a surf beach further along. The surfing, boarding and swimming are tremendous. It is not uncommon to see dolphins frolicking out in the surf. The beach stretches for two kilometres to the south, then over a headland called Mermaid Pool for many more kilometres of untouched beach backed entirely by the National Park. The name of this headland comes from the captivating tidal pool at its centre. The crashing surf at high tide provides spectacular photo ops. Snorkelling is popular on the south side of the headland. If you walk north from the lagoon mouth, the beach will take you towards Swan Lake. The lake is usually closed to the ocean but on rare occasions the sand is washed away. The geology of the area provides Berrara Beach with interesting rock formations and headlands. Low tide at the beach exposes intriguing rock pools just north of the creek mouth with sea stars, colourful anemones, camouflaged octopus and other marine life. The assortment changes with the seasons. When water sports are not on the agenda, there are plenty of other things to do year round. There are great walks and bike tracks of varying lengths along the shoreline and ocean bluffs as well as through the bush of the National Park. There is also a community tennis court just a short bike ride away in the village of Cudmirrah near the shore of Swan Lake. If you prefer, you can idle away your holiday on the cabin deck with some invited friends relaxing comfortably in canvas directors chairs having a drop of your choice while cooking over private gas BBQ overlooking the lagoon or in the fully equipped kitchen looking out on grevelias. If the temperature dips, you can move inside to the welcoming warmth of a wood fire and still admire those stunning sunsets and glistening waters through the floor-to-ceiling windows. In addition to sharing this beautiful natural environment with the kangaroos, you will also see possums and bandicoots, and a variety of lizards including Blue Tongue and Eastern Water Dragons who frequently sun themselves beside the cabin. The varied bird life is wonderful with 150 species listed for the area and changes seasonally. You may see the resident pair of satin bowerbirds, the endangered hooded plovers that nest along the ocean headlands (less than 50 in NSW) or the majestic sea eagles with an offspring. Parrots abound and are happy to be hand fed, including king parrots, rainbow lorikeets, crimson rosellas. With native plantings surrounding the cabin, numerous species of honeyeaters are regular visitors. The creek provides ideal habitat for a variety of water birds such as egrets, herons, kingfishers and ducks. An evening walk along the banks of the creek will often be rewarded with a sighting of a night heron feeding. Easter is a perfect time to see young ducklings and black cygnets. Out of consideration for the abundant wildlife, domestic pets are not allowed. A lovely quiet place to spend a few days with family. Our son loved running around on the grass in front of the cabin and looking at the birds and the kangaroos. Lovely place to stay, great surrounds. My family had a wonderful stay a Kangaroo cabin. The cabin is exteremly well decked out with good books, games and DVD's for those lazy times. The proximity to the creek and beach is fantastic. The kids were constantly kayaking and fishing with parents happily drinking wine and eating cheese whilst watching from the deck. I had no phone or internet connectivity whilst at the cabin. For some this may be an issue, for myself it was heavenly. Overall it is a wonderful cabin with everything we required for a great stay. Nice to hear that you and your family enjoyed the lazy days at Kangaroo Cabin. Your comment about no wifi made me smile because every time we're at the cabin, all we can do is relax, engage with one another and the natural beauty surrounding us. No distractions! Beautiful scenery, great location and plenty of wildlife. A very satisfying holiday. My girlfriend and I arrived at kangaroo cabin, and as soon as we parked our car we saw a bunch of kangaroos opposite our cabin. The view from the cabin looking straight out onto the lagoon was picture perfect and having breakfast with the kangaroos in the morning was an unreal moment that we experienced. Loved the fireplace!! One day it was cold and windy so at night we use the fireplace which was warm and relaxing. The beaches are very close by and same with some bushwalking trails. The cabin had pretty much everything we needed apart from there being no internet, but that didn’t really matter considering how many things there are to do in the area even just sitting around on the deck watching the wildlife and surrounding scenery was beautiful. Will be recommending to all my friends and family about kangaroo cabin. So glad to hear that you and your girlfriend enjoyed your stay, Ty. I love being there in winter with the wood burning stove going. The only thing missing is snow!